Gina Marie, lead singer, is no stranger to the hope and healing found when you submit your life to Jesus Christ. Her contagious joy and sincere heart are evident in her concerts and appearances. She is not only a wife and a mother, a professional and a servant, but she is a minister of the gospel through music and testimony. Gina Marie is vocally trained by several well known vocal trainers in the Gospel Music Industry which include, Steve Hurst, The Steve Hurst School of Music, Nashville. 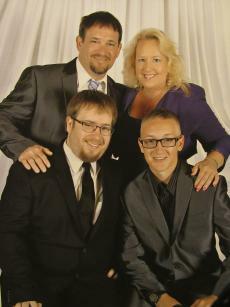 Joyce Martin, The Martins. Debra and Lauren Tally, The Talley Trio. Chris and Carol Beatty of VocalCoach.com, Steven Nix of Nix-it Publishing. Gina Marie sings and speaks with the authority that comes only from her Savior. She is very particular about the music she chooses in an effort to get the message of Faith, Hope and Love to everyone who hears. Dan, vocalist/evangelist, also doubles as stage manager, bus driver, and just all around Everything Guy. His testimonies of Healing and Restoration will touch you, and inspire you. Dan also has received vocal training through The Virginia Christian Music Conferences, Steve Hurst School of Music, Steven Nix, and Eddie and Jessica Harrison and Donna Beaveau from Hope's Call. He also has stage management and presence training through Wingspan Consultation, Nashville. He's also a Graduate of RHEMA Correspondence Bible School, and an ordained Pastor. He also hosts the radio program, "Deadeye Dan's Outdoor Adventures". Todd, is an anointed and remarkable singer. Todd's joyful spirit and unsurpassed stage presence will surprise you. Todd began singing at the age of 2. Todd has been receiving vocal training from Eddie and Jessica Harrison and Donna Beaveau from Hope's Call and The Steve Hurst School of Music. He also is trained in stage presence and choreography through Wingspan Consultation, Nashville. Todd has a desire to become a Preacher some day and Truly sings from his heart to The Lord. Tyler, has currently blessed us once again with his singing abilities.He has also been trained by some of the best people in the industry. Tyler brings to the family, a joyful spirit, and a strong heart for the Lord. Welcome back to the stage Buddy.